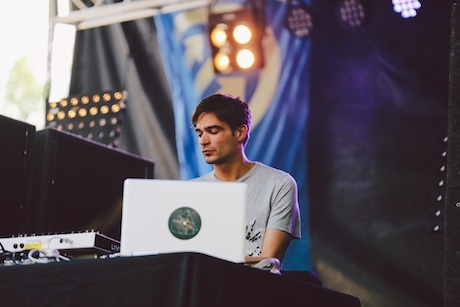 Live, U.K. producer extraordinaire Jon Hopkins makes the musical equivalent of modernist architecture, beginning each song with bare bones and then fleshing them out, but never so that the original structure is obscured. He applied his deft touch first to "We Disappear" of off his Immunity LP. Then, he briefly forayed into modern dubstep territory before stripping the song back to dubstep's more minimal roots and began set highlight "Open Eye Signal." When he finally brought the song's bass hum to bear on the clatter he'd amassed, the crowd responded physically, but Hopkins could never be so ingratiating; teasingly, he stripped it all back once more, maintaining the rapt attention of his Blue Stage crowd. "Collider" was perhaps the perfect example of Hopkins' striking ability to control the highs and lows of a set, as he let samples ebb and flow with seeming ease, including that which he used for Coldplay's "Life in Technicolor." By expertly working the crowd, Hopkins made his lengthy recorded compositions feel beautiful in their temporality.